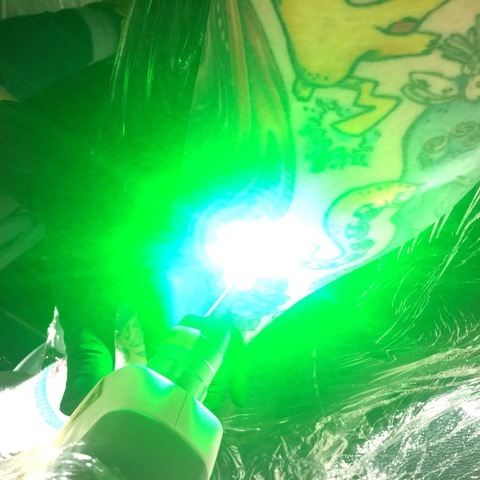 A Laser produces a very high powered light energy which passes through the skin, this energy is then absorbed by the tattoo ink deep within the dermis layer. The light energy rapidly heats, expands and shatters the ink into tiny particles they are then fought off by the immune system, mimicking the natural fading that time or sun exposure would create. Can a tattoo be completely removed? 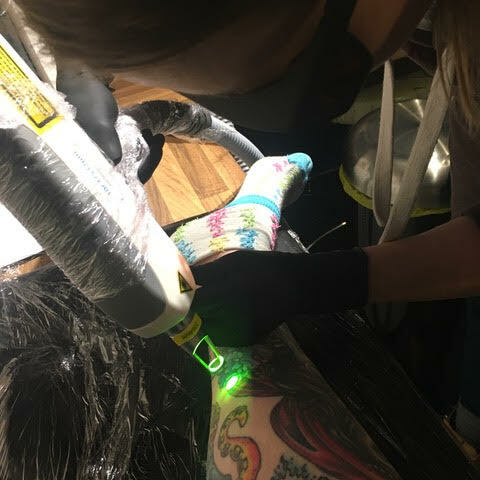 Tattoos carried out by professionals can often be the most difficult to remove as they are applied to the skin more consistently where a tattoo applied by an amateur will have ink which is more sparsely applied and of a lesser quality. However, an amateur tattoo artist inexperienced in application and skill can cause pockets of ink that are too deep in the skin and extremely difficult to remove. Ink is also a factor to consider as there is no recognised international standard for the manufacture of tattoo ink therefore the composition of some inks may hinder the effectiveness of removal. In reality total removal may not be possible despite the use of the most advanced removal equipment. Can every colour be removed/lightened? Black is the most effective at absorbing the light energy so can fade to the best results if the above factors are favourable. Brown, red, orange, dark green, blue & purple can also be successful to be faded to a standard to allow a cover up but may not remove completely. Light green, pale blue, teal, turquoise & pink can be lightened but are often difficult to remove completely. White, yellow, light green, skin tones & fluorescent or UV are usually untreatable as they are too light for the laser to pick up. Please Note: white, pink, flesh tone, red, light brown, fluorescent or UV may contain ingredients in the ink that can cause allergic reactions or irreversible darkening due to carbonisation upon removal although rare our patch testing is an essential process to prevent and identify any possible future complications. The radiation emitted by a laser is non-ionising and carries no risk of cancer or other abnormal cell growth. The procedure is non-surgical and non-invasive and it is perfectly safe when carried out by a fully trained certified professional. Laser can cause some mild discomfort and it is usual to feel a small amount of soreness afterwards. It is likened to being ‘pinged’ by an elastic band. It is easily tolerated but everyone’s experience will be different and repeat treatments can reduce pain. Will laser leave a scar? It is very unusual to develop a scar but it can be a possibility especially if the correct aftercare is not followed. Occasionally you will but usually the tattoo will look normal again after treatment. The main fading is in first 4-6 weeks after treatment. Can I have part of my tattoo removed for a cover-up? 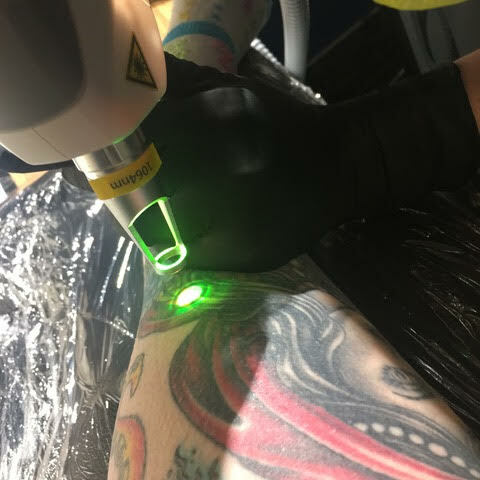 Yes our laser is extremely accurate and we work closely with our tattoo artists to only remove what you need for an effective cover up. How long before I can have the area tattooed? Your skin will be ready to be tattooed following a minimum of six months after your last treatment, this is to prevent the fading of the new tattoo due to previous laser treatment. Usually between 5-10 minutes dependent on size of area, but we will not treat an area too large in order to minimise skin trauma. Sessions will need to be 5-6 weeks apart on the same area or 2-3 weeks apart on separate areas. It can take 2-4 sessions to fade for tattooing or 12+ sessions to completely remove. Leaving longer times between treatments can often achieve better results. Our extensive consultation is £30 and can take up to 40 minutes. Laser sessions start from £40 dependent on the type of tattoo, size and colours used. We will be able to give you a full estimated price and time scale upon consultation but be aware that this estimate may vary depending upon treatment analysis.